Yep…I was in a helicopter. No lie. Over Waimea Canyon even. This morning Steve and I left the rest of the family behind and headed to the office of Blue Hawaiian Helicopters for our tour of Kauai. As soon as we’d booked our airline tickets and I’d begun my research about our destination, I knew we would have to take a helicopter tour. The guidebook said that “coming to Kauai and not taking a helicopter tour is like going to the Sistine Chapel and not looking up.” I was sold. I could not miss that opportunity. After careful research about the best tour companies, I confidently chose Blue Hawaiian, picked a random date early in our stay (just in case inclement weather dashed our first attempt at a ride), and committed the fee to our credit card. The deed was done. So this morning we drove off toward our helicopter ride praying that the clouds would lift enough after last night’s heavy rains to afford us a memorable trip. Apparently all our finger crossing worked because the trip was amazing. Neither of us had ever been in a helicopter before, and we were anxious to cross it off our t0-do list. Our pilot Scott, a retired police force pilot from Texas, was a perfect host. 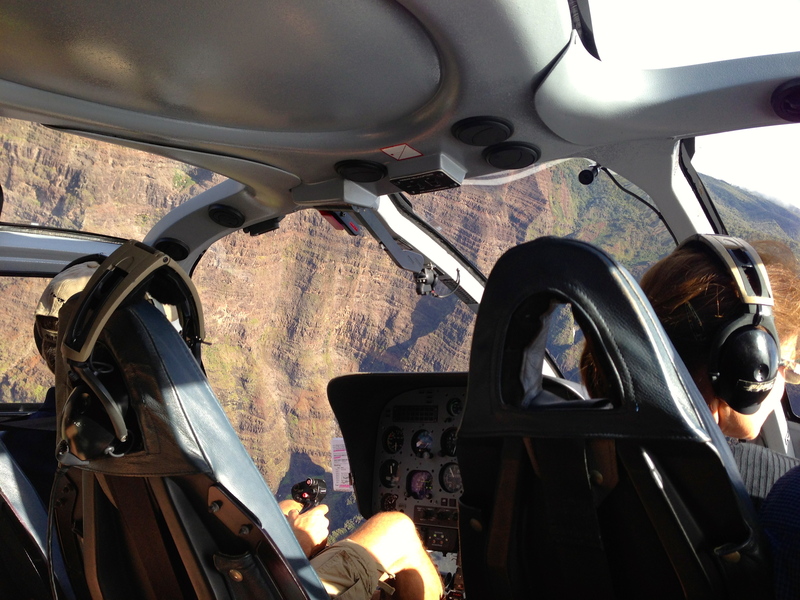 Taking off from Lihue, we circled clockwise around the island, taking in the south shore (and some whales) before heading to Waimea Canyon and then over to the Na Pali coast. I’m fairly sure I spent the entire 55 minute flight shaking my head at the beauty. Un-be-liev-able. My favorite part of the trip was definitely our journey into Mt. Waialeale, the crater of the extinct volcano that formed this gorgeous island. It is one of the rainiest spots on earth, averaging over 430 inches of rain per year, and it shows. 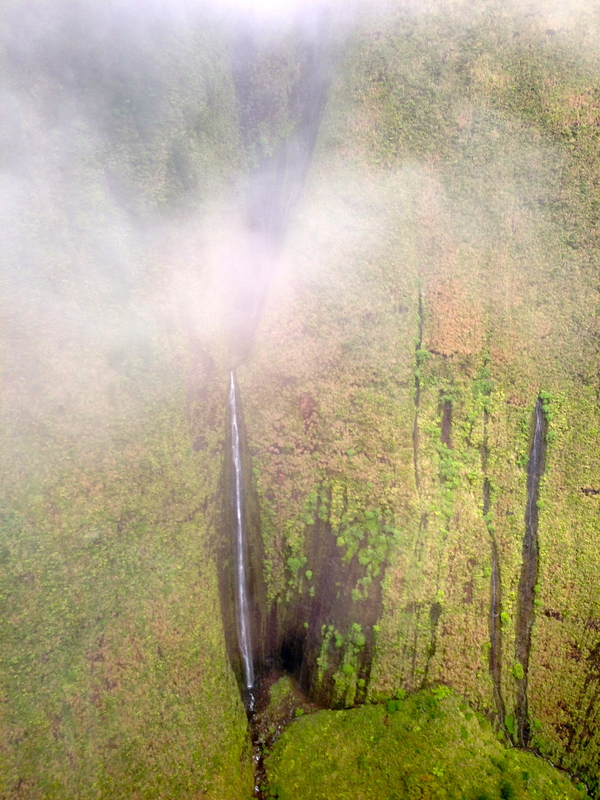 The steep, volcanic rock walls are blanketed in lush green carpets that ooze waterfalls. I’m still shaking my head as I write this. After our tour, it took a while to get our heads back on straight. When we’d done that and had some lunch, we decided our next stop would be the north shore because as we’d flown over that part of the island in the morning it had been sunny. We headed through Wailua, Kapa’a, Anahola, and on our way to Princeville we saw the sign for ‘Anini Beach. This particular beach had been on my list of beaches I wanted to visit for snorkeling, so we stopped. 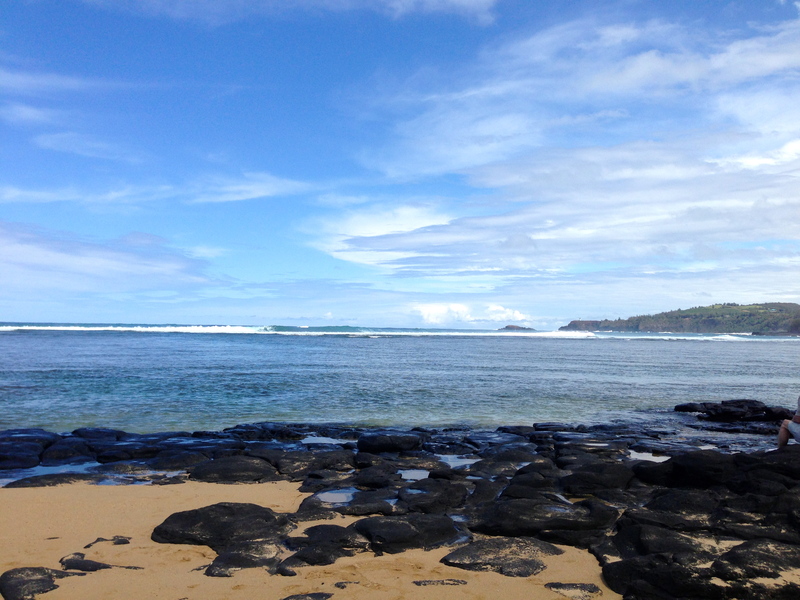 ‘Anini is fringed by a long reef, which keeps it protected from the pounding surf. I was at first disappointed that the bottom was so sandy and the fish were so scarce. But doggedly determined I am so, like Dory, I just kept swimming. After about ten minutes of seeing not a whole heck of a lot, I hit the jackpot. There, a hundred yards from shore, I found a lone green sea turtle feeding on the plants at the bottom of a sandy flat. I quickly popped my head up to signal to hubby and the boys but they were having technical difficulties with their gear. I had my turtle sighting, though, and I didn’t intend to let it go. I enjoyed 20 minutes swimming along with that turtle by myself, basking in the wonder of it all, joining it on the surface for air so I could see it out of water too. Not wanting to be a total turtle hog, though, I hung out there with my reptilian buddy long enough for Steve to adjust his equipment and share in the moment with me. Of course we’d left the waterproof camera back at the condo, so this guy will have to live in our memories. When I’d debriefed the boys about what they had missed, it was back into the car to head on toward Hanalei. We stopped for our first shave ice and some shopping for gifts. Dinner was at Bubba’s Burgers (Kauai beef…had to do it) before taking a quick trip out to the sand at Hanalei Bay. The surf was too rough and the beach was closed for swimming, so we settled for watching the boys toss sticks into the ocean and delight when the waves returned them. 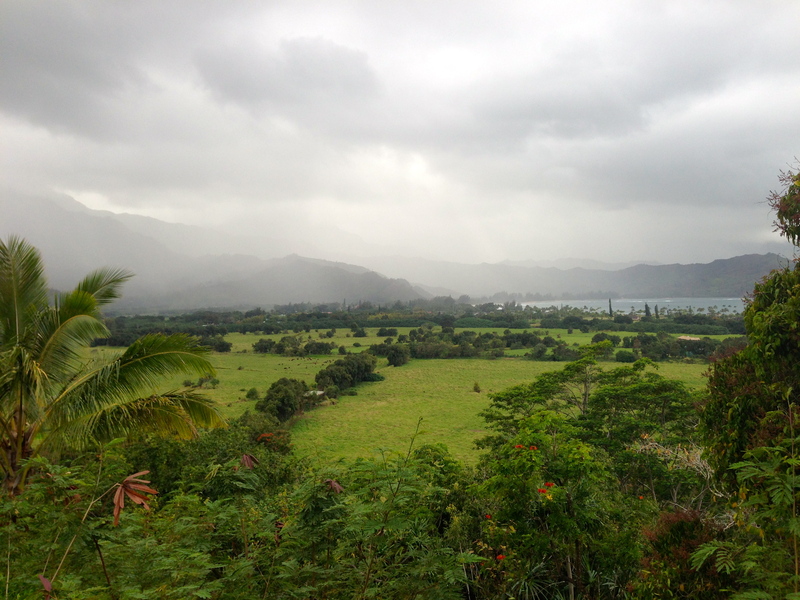 Hanalei, despite its overcast and gloomy skies today, is a hard locale to beat. Everything about it is charming. We will need to head back up that way again in the next few days because we skipped the Kilauea Lighthouse and the bird sanctuary, and I would like to try the snorkeling at Tunnels Beach. 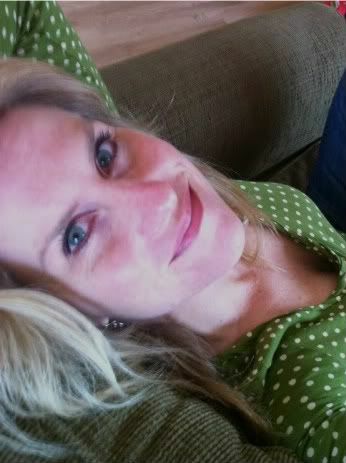 Overall it was another great day today. I might be pressing my luck by saying this, but I’m having a hard time imagining how this island could ever disappoint. Can’t wait to see what tomorrow will hold.